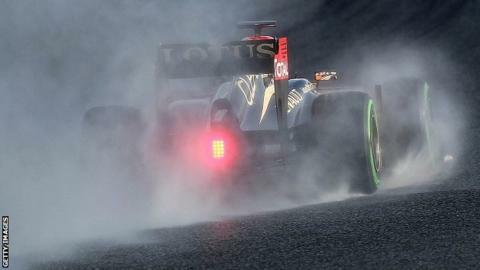 Lotus's Romain Grosjean set the pace on a rain-interrupted second day of the final pre-season test. The Frenchman headed McLaren's Jenson Button by 0.465 seconds at Barcelona's Circuit de Catalunya. Williams's Pastor Maldonado was third ahead of Red Bull's Sebastian Vettel, who was 1.027 seconds behind Button. Mercedes driver Nico Rosberg and Ferrari's Fernando Alonso ended the day bottom of the times after not running when the track was at its driest. The 11 teams are preparing for the start of the Formula 1 season in Melbourne, Australia on 17 March. The four-day test finishes on Sunday. The Red Bull looks well balanced with lots of grip. The Ferrari lacks rear grip. It really has no traction in the wet. The weather conditions meant the teams faced limited running, with only about an hour on a dry track before the lunch break and a further two-and-a-half hours in the afternoon before the rain returned. But Lotus engineer Mark Slade, who runs the car of Grosjean's team-mate Kimi Raikkonen, said the team were confident they were in good shape ahead of the new season. "There's nothing standing out saying we've got a big problem," Slade said. "A number of issues we had last year are better and we've got some good developments coming. "So we feel pretty confident about being competitive but don't know where everyone else stands." Grosjean set his fastest time on the 'soft' tyre, while Button was on the slower 'medium'. The teams are using this test to try out their latest development parts. Red Bull evaluated a 'passive DRS' system, which activates above a certain speed to reduce the drag created by the rear wing. It is a system pioneered, but never raced, by Lotus last season and those teams and Mercedes have all tested it on track this winter to see whether it can be reliably operated ahead of this season. Ferrari, meanwhile, evaluated a new exhaust configuration, front wing endplates and diffuser on Friday and are expected to try a new rear wing on Saturday. Fernando Alonso tried a race-simulation test in the afternoon but it was interrupted by the returning rain. Alonso said that despite the conditions he had had a "perfect" day of testing and the team had learned a lot. "The confidence we have now is much more than what we had last year at this time because at the last test last year we more or less know we were two seconds behind the leaders," he said. "This year is different. We are much more confident. The target of all of us was to reduce the gap to pole, which was 0.7-0.8 seconds to the top teams, and we hope we have reduced that gap and will arrive in Australia in a little bit better shape than in Brazil (the last race of 2012), which means 200 times better than Australia last year." BBC F1 technical analyst Gary Anderson said that the Red Bull looked the most composed car on the circuit. "The Red Bull looks well balanced with lots of grip," Anderson said. "The McLaren and Sauber have understeer (a lack of front grip) and the Lotus is well balanced but not as planted as the Red Bull. "The Ferrari lacks rear grip. It really has no traction in the wet." The morning started off very wet and after intermittent rain had ended the track began to try in the final hour before the lunch break.